Three Massey University staff members and several students and alumni are finalists in this year’s Women of Influence Awards. The awards recognise and celebrate women from all walks of life who make a positive difference in the lives of their fellow New Zealanders. Finalists were announced on Sunday and include School of Management senior lecturer Dr Farah Palmer in the Board and Management category and Māori student success director Naomi Manu and senior lecturer in security studies Dr Negar Partow in the Diversity category. Massey Vice-Chancellor Professor Jan Thomas says she is delighted to see so many Massey women named as finalists. 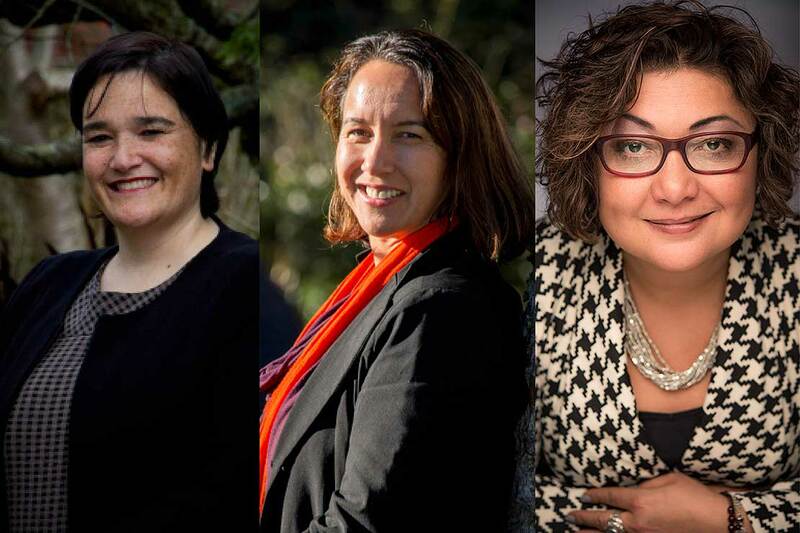 “The women on this list are contributing to a stronger Aotearoa New Zealand – whether it be at the community level, national or international arena,” Professor Thomas says. “Staff, students and alumni populate a range of categories and we take great pride in their example, entrepreneurship and thought leadership. For the third year running, Massey University has sponsored the Global category. The winners will be announced at an awards dinner at the SkyCity hotel in Auckland on September 18. Tickets and more information about the awards programme is available at the Women of Influence website. As a senior lecturer in Massey University's School of Management and director of the University's Māori Business and Leadership Centre, Dr Farah Palmer, Ngāti Maniapoto, Waikato, is not shy of hard work. Her research includes gender issues in sport from a sociological or kaupapa Māori perspective; diversity issues in sport management and leadership; and Maori leadership and governance in sport and business. Many will remember Dr Palmer as a former Black Ferns captain, who led New Zealand to three World Cup titles between 1998 and 2006. More recently, she was the first female elected to the board of New Zealand Rugby. She is also the namesake of the Farah Palmer Cup, the biggest women’s provincial rugby competition. As director of the Pūhoro STEM Academy, Ms Naomi Manu has made an impact on a lot of young Māori lives. In 2015, Ms Manu took on the mammoth task of improving Māori participation rates across tertiary science programmes by developing Pūhoro, the first science academy of its kind. Through hands on engagement, the programme has seen its students surpass national pass rates, with more continuing on with senior science, and students being more connected to their career industries. Her success has been recognised with her appointment as director, Māori student success, where she will continue to help the University promote Māori student success. Dr Partow, a specialist in Middle East politics, religion, human rights and global security, joined Massey in 2012. Born in Iran’s capital city, Tehran, Dr Partow lived there through the 1979 Islamic Revolution, which saw the overthrow of the Iranian monarchy and its replacement with an Islamic republic under Ayatollah Ruhollah Khomeini. She grew up there during the 1980 to 1988 Iran–Iraq War. Coming to New Zealand in 2002, her unique background and excellence as a researcher made her a valued addition for the University’s Centre for Defence and Security Studies. Commenting on issues like the Israel-Palestine conflict, ISIS and many hot geo-political discussions as well as leading papers in the Middle East security environment and international security. Dr Mahsa Mohaghegh, who graduated with her doctorate in computer engineering from Massey University in 2013 is a finalist in the Community and Not for Profit category. She is joined in the category by current Master of Applied Social Work student Marie Nee, who is also a project manager and youth worker for Te whānau o waipareira Trust. NZ On Air chief executiveJane Wrightson (Master of Business Administration, 1994) and Inland Revenue chief financial officer, Lara Ariell (Bachelor of Business Studies, 1991) are finalists in the Board and Management category. Little Yellow Bird founder and chief executive officer Samantha Rae Jones (Masters in International Security, 2014) is a finalist in the Global category, alongside current Bachelor of Arts student Shahed Abu Jwaied.